Viola flowers are edible, which makes them a perfect addition to the herb garden. Viola tricolor is a host plant for several butterfly species, including Variegated Fritillary, Great Spangled Fritillary, and Gray Hairstreak. 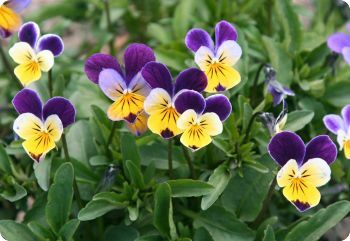 Common names include Wild Pansy, Johnny Jump-Up, and Heartsease. Also known as Viola cornuta 'Helen Mount'. Hardy in zones 4-9. Viola is a short-lived perennial with small flowers in a wide range of colors. It thrives in full sun to part shade. Easy to grow from seed. Start viola seeds indoors 8 weeks before the last frost date. Or sow outdoors 4-6 weeks before the last frost. Barely cover the seeds with soil. Spacing 4". Viola 'Bambini Mixed' blooms in a wide range of colors and bicolors with cute pansy faces. The flowers are quite large for a viola. It is perfect for containers, as well as the front of the border. Also known as Viola 'Large-flowered Bambini Mix'. Hardy in zones 5-9. Plant in late summer to early fall in mild winter climates. Viola 'Chantreyland' is a lovely selection with soft apricot-orange flowers. The flowers are relatively large for a viola. 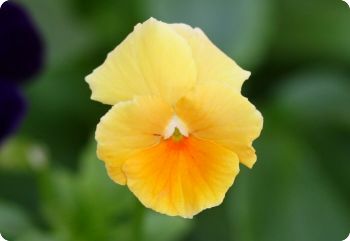 Also known as horned violet or tufted pansy. Violas are more free-flowering than panises, which makes up for the blooms being smaller. Hardy in zones 5-9. Viola 'King Henry' is an heirloom variety with royal purple flowers that have a small golden eye and deep purple whiskers. It looks great with spring bulbs, and it makes a good companion for other plants in containers. King Henry viola has small flowers, but it's a good bloomer, and it often overwinters and self-sows in the garden. Formerly known as Viola 'Prince Henry'. Hardy in zones 5-9. Viola 'White Perfection' has pure white flowers with a light fragrance. Violas bloom best in cool weather, slowing down in the heat of summer. Give them afternoon shade, and deadhead the flowers to prolong the bloom season. Hardy in zones 5-9. Viola 'Yellow Perfection' has lemon-yellow flowers. It makes a cheerful addition to containers and small gardens, including the herb garden. Viola flowers are edible. They can be used for garnishing, adding color to salads, or decorating cakes and desserts. Hardy in zones 5-9. 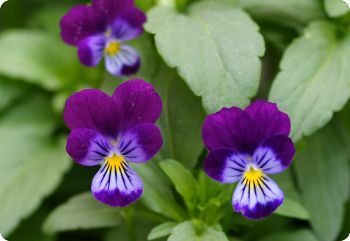 Viola 'Admiration' has solid, violet-blue flowers. It's a nice color that goes well with all sorts of other annuals and perennials. Violas attract butterflies and beneficial insects, making them good companion plants in the vegetable garden. Hardy in zones 5-9.